“When your winless streak matches your age” tweeted Magnus Carlsen after 26-year-old Fabiano Caruana missed a clear win against Leinier Dominguez, making it a 26th classical game in a row without a win. But for that miss we would have had the big three of Hikaru Nakamura, Wesley So and Fabi all in the lead, but instead Dominguez takes Fabi's place. They’re joined by Jeffery Xiong, the hero of Round 3 after defeating defending champion Sam Shankland. 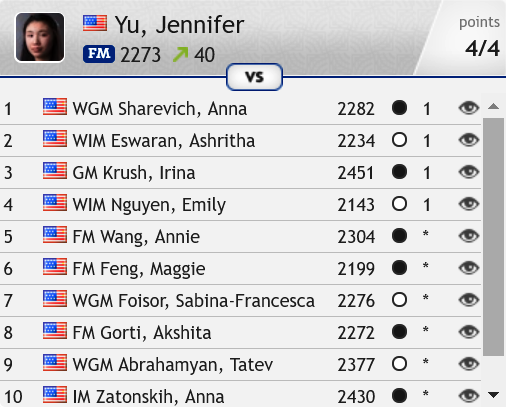 Jennifer Yu leads the women with a perfect 4/4, making her the last player in with a chance of winning the $64,000 Bobby Fischer prize. Dominguez admitted he’d been about to resign before this “atrocious” blunder (Caruana’s word), but suddenly he realised that after 47…Qf6! he wasn’t even particularly worse. That mistake could be explained away by time trouble, but it was still somewhat reckless to put the queen as far away from his own king as possible. After 71…Qe3+! it soon turned out that with the white queen and rook both AWOL there was no way to stop a draw by perpetual check. 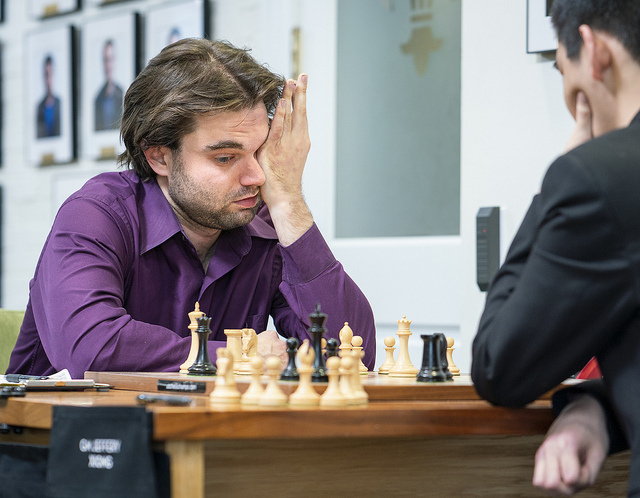 A total of 26 games, and the World Champion, who had come in for criticism himself for his drawing streak before he finally won a game in Wijk aan Zee earlier this year, wasn’t going to miss an opportunity! Magnus now has a 34.7 point lead at the top of the world rankings, with Fabiano in real danger of losing his 2nd place to Ding Liren. Anish Giri decided to raise his head above the parapet, with perhaps inevitable results! 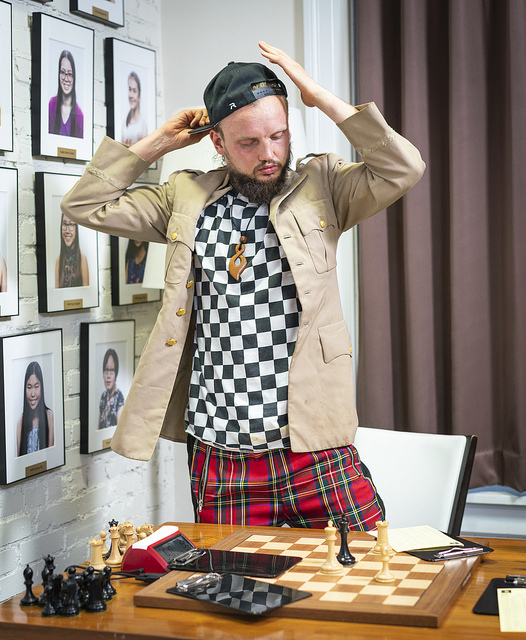 Magnus will be playing more Banter Blitz here on chess24 at 18:00 CET on Sunday 24th March! After Round 3 there had been a sole leader, Jeffery Xiong, who pulled off the impressive feat of beating defending champion Sam Shankland. In fact Jeffery was also the last player to beat Sam in a US Championship, 17 games ago back in 2017! Some mistakes were made, but Jeffery went on to win in 41 moves. In Round 4 Xiong’s luck ran out against Ray Robson, even if it took Ray 12 moves to accept a piece sacrifice he could and should have taken immediately! 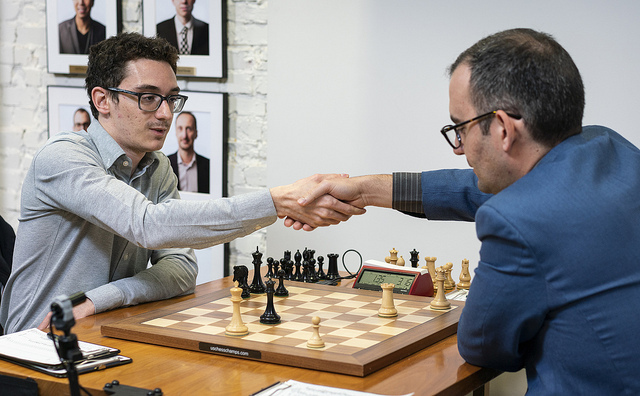 The other games were all drawn, but we’ve already seen the drama of Caruana-Dominguez, and that was matched by Sevian-Gareyev. First the entrance, a fashionable 25 minutes late! 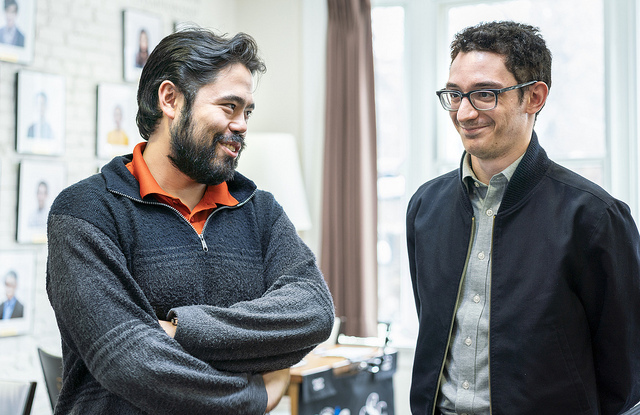 When quizzed about it afterwards Timur offered no explanation and just shrugged, “Ah, that’s life!” He revealed he’d also been playing in another local tournament for a little rest and relaxation. 32…Rxb2!! came as the coldest of cold showers for Sam, since 33.Rxb2 runs into 33…Rxc4+ 34.Kf3 (34.Bd4! is better, but Black is still on top after 34…cxd4) 34…e4+! and Black is winning. Sam was in danger before the time control, but then regrouped well and ultimately even got to test if Gareyev could hold the theoretically drawn but tricky Rook vs. Rook + Bishop ending. He did, and that’s now two draws in a row for by far the tournament’s most eccentric player. 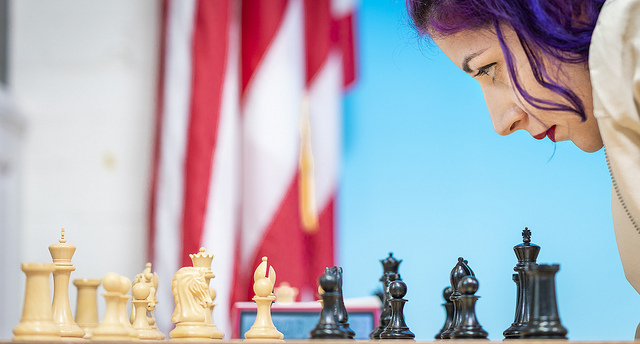 It’s of course hugely unlikely that she’ll win $64,000 for repeating Bobby Fischer’s feat of scoring a perfect 11/11, but as you can see she has already defeated the highest rated player in the tournament. Jennifer found the forced 33…Qg5! 34.g3 Nf3+ 35.Kg2 Ne1+ and was soon a pawn and two exchanges up, with the white king remaining in danger. 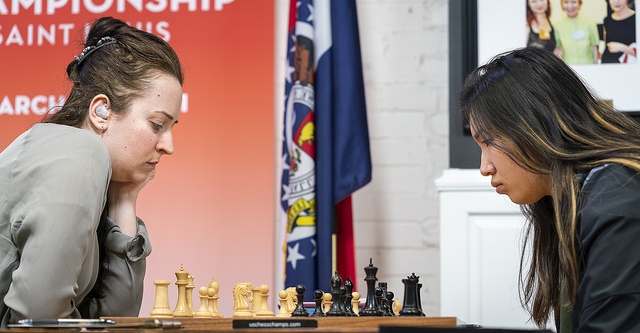 It would go from bad to worse for Irina, who put up heroic resistance before losing to Sabina Foisor in 146 moves in Round 4. Irina’s old rival Anna Zatonskih is in clear second place, just half a point behind Jennifer. We got to see the point in the game, as 14.Qxc4 ran into 14...Nxe5! 15.Nxe5 Bb5! and the white queen had been trapped. Tatev went on to win in style.